According to the WRD (World Register of Dams), Turkey has over 741 dams in operation, as well as several dozens under construction. These modern infrastructures, built to regulate floods or produce hydroelectricity, I argue here, constitute good chronological markers indicative of larger processes at hand in Turkey. Taken like archaeological artifacts, they have much to tell us about the political, economic, and social history of the country over the last five centuries. Taken further apart, entangled within a larger global social network, dams even have the potential of revealing the stories, for instance, of an Armenian family that revolutionized Ottoman architecture, of cement and steel factories in Germany before and after World War II, of US Air Force soldiers swimming in a lake in Southern Turkey, and of a future Turkish President daydreaming about his country’s future near Las Vegas. Below is a short preview of some of these stories. Between the 17th and 19th century, a total of eight dams were built around Ottoman Istanbul to provide water for the city. Far away from its center, and therefore less visible, their style are nevertheless a reflection of the time. 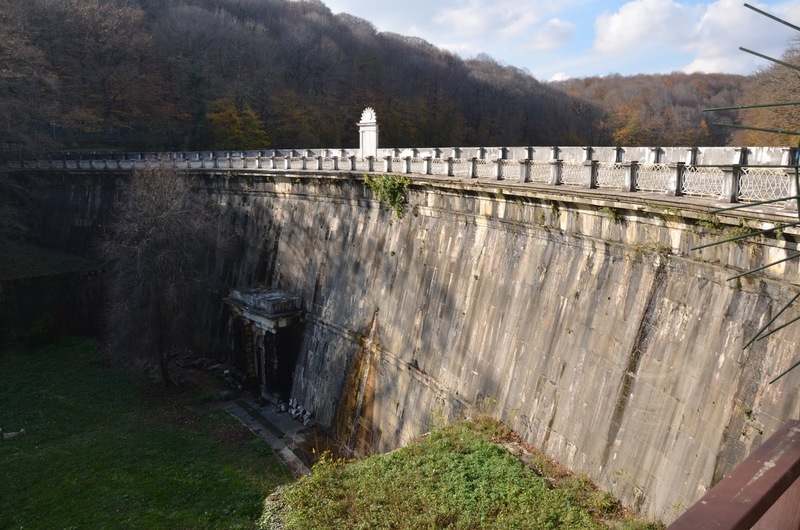 The Sultan Mahmud II Dam was built in 1839 in the Belgrade Forest to reinforce the already existing Taksim conveyance system serving the growing westernized, non-Muslim, upper-class population of Beyoğlu. This masonry gravity arched dam, which resembles contemporary constructions in Western Europe, is adorned with Roman columns, tulip-shaped gargoyles, and an oval shaped medallion with a radiating sun. A room inside the walls of the dam, built like a shrine around the water valve, also serves a technical as well as an aesthetic purpose. Like many other monuments of 19th century Istanbul, this assorted mix of Baroque, Rococo, Neo-Classical, and Empire styles reveals the European influence on the city’s architecture, as well as the larger social and economic changes experienced by the empire during this period of westernization. Also located in the Belgrade Forest, the Valide Sultan and Topuzlu Dams, for example, were built by Krikor Balyan, a member of the family of architects responsible for, among many other monuments, Dolmabahçe Palace, and the spread of this particularly eclectic architectural style in Ottoman Istanbul. Located just 12km north of Ankara, the Çubuk-1 Dam is another sign of its time. Built between 1930 and 1936 to control floods and provide drinking water to the new capital city, Aslıhan Demirtaş explains how its construction was supervised by Walther Kunze and Heiden Berger of Germany, a certain “Mösyö Sapot” of France, and Tahsin Ibrahim, a graduate of Istanbul’s School of Engineering. Originally planned as a stone-fill construction, the more conventional and better-known method used in the old capital city Istanbul, “Mösyö Sapot” instead recommended the use of concrete. He convinced the other three that this would avoid the high cost of transporting stones from a quarry. Moreover it was thought that this more advanced technique would make for a better dam overall. Subsequently, instead of using local stone quarries, the building material for the dam was imported by railway from Germany, in the end, raising the overall cost of the dam and making the concrete more expensive than the stones. Concrete, however, visually more modern and progressive than the old stones used for dams in defunct Ottoman Istanbul, seemed a better match for the image the new capital city of the new Turkish Republic wanted to give itself in the 1930s. If Turkey’s first “modern” (i.e. concrete) dams appear in the first half of the 20th century to provide water for the developing cities in the west such as Ankara, it is in the second half of the century that they are built across the entire Anatolian landscape to produce energy. At the establishment of the Turkish Republic in 1923, electricity was only available in a very limited number of large cities. If smaller hydroelectric power plants had previously been tested in Tarsus (1902) and Istanbul (1913), the turning point from controlling water to generating power occurs more precisely after World War II. Built in 1956, the Sariyar Dam near Ankara marks this shift as the earliest large Hydroelectric Power Plant (HEPP) built to meet the country’s rising energy needs. Finished the same year just north of Adana, the Seyhan Dam also holds a particular significance in Turkey’s recent history. Its construction began a few years into the era of multi-party rule in Turkey. The Democratic Party (DP), newly founded in 1946 to challenge the Republican People’s Party (CHP), the only one in power since the establishment of the Republic, made the production of hydroelectricity through the construction of dams on the rivers of Anatolia one of its platforms during the 1950 electoral campaign. After a historical, and somewhat unexpected, victory of the DP over the ruling party, the newly elected government would indeed ensure that the Seyhan Dam be built. 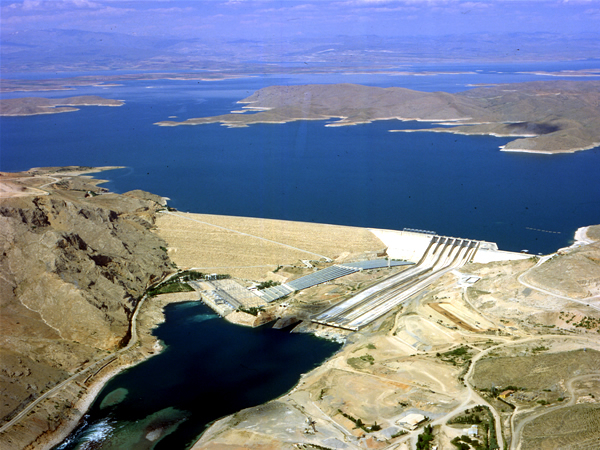 Besides serving as a chronological indicator for the transition period CHP-DP and the start of America’s intense involvement in Turkey, the Seyhan Dam holds another symbolic dimension. The head engineer of the project was none other than the king of dams himself, Süleyman Demirel, future Prime minister and ninth President of Turkey. After studying Civil Engineering in Istanbul and the United States, Demirel was appointed in 1955, at the age of 31, Director General of the State Hydraulic Works (Devlet Su Işleri or DSI), the public agency responsible for managing the country’s water. At the head of this institution, Demirel would realize his civilizing mission through the construction of dams. Water, he explains, needed to be tamed so that light could finally rescue the Anatolian countryside from obscurity. Seyhan also announced more World Bank activities in Turkey. Beginning in 1967, for example, the international institution provided Turkey with technical assistance for the reorganization of its electric power industry. Ankara also sought monetary loans from the World Bank, as well as from the United States and the European Economic Community (EEC), as early as 1961 for the construction of the Keban Dam near the city of Elazığ in Eastern Turkey. While the European Investment Bank (the loaning institution of the EEC) supervised the building of its Hydroelectric Power Plant, the International Bank for Reconstruction and Development (the loaning institution of the World Bank) advanced Turkey $25 million for transmission lines sending electricity to Ankara and Istanbul. At the height of the Cold War (construction work at Keban began in 1966), these World Bank loans to Turkey, a NATO member since 1952, played an important role in the diplomatic strategy of the West in the Middle East. Through investments in a country, which at the time was bordering the Soviet Union, the United States was thus strengthening its ties and reinforcing its position against the Communist Bloc. Sariyar and Seyhan in the 1950s, as well as other large dams such as Keban in the 1970s, announced many of the impending political, economic, and social changes in the country. Built from 1966 to 1975, and thus overlapping with Demirel’s first term as prime minister, the Keban Dam not only continued a period of intense construction, but also marked a shift in scale. The yearly energy production of Keban’s HEPP (1240MWh) represents a significant increase compared to the earlier Sariyar (160MWh) and Seyhan (54MWh) Dams. In Süleyman Demirel’s words, Keban was a dream come true; a dream going back to his time in the United States as a student, when sitting on the walls of the Boulder Dam in Nevada, he dreamt of the day his own country would have such a large dam. Lastly, but not least importantly, the Keban Dam denotes a shift in the country’s consciousness vis-à-vis their construction. With Keban, the largest dam built in Turkey at the time, the threatened natural and cultural heritage of the region makes its appearance on the national stage. With the launch of a national fundraiser for the salvage of ancient monuments organized by the newspaper Milliyet in 1968, cultural heritage begins to be seen as something to be rescued and preserved from modernization and progress. Academics, businessmen, journalists, politicians, as well as banks, private corporations, and ultimately the government donated money in an attempt to counteract the dam’s negative effects. In the summer of the same year a rescue project designed to study the endangered sites is launched by the Middle East Technical University. If the Keban Dam is still perceived as a sign of progress for the nation, both its fundraiser and rescue project do signal a raising awareness in the public of the destructive effects of dams on their surrounding environment. The Keban Dam in the 1960s was admired as an engineering feat, a symbol of modernity, or, in Demirel’s words, a dream come true. If these early dams were all celebrated as national achievements, inaugurated festively, and placed on commemorative stamps, subsequent large dams would not enjoy the same success. Keban paved the way for a series of ambitious constructions on the Tigris and Euphrates Rivers and the launching of the Güneydoğu Anadolu Projesi, the GAP or Southeast Anatolia Project, a development project conceived around dams in order to provide water, electricity, and jobs to the impoverished, mostly Kurdish, southeastern provinces of Turkey. None of the dams built as part of the GAP, however, have remained unquestioned and uncontested. Today a countless number of organizations across the country, environmental activists and human rights groups, have joined hands to protest against the destruction and drowning of, among other places, Allianoi, Zeugma, and Hasankeyf, as well as the Fırtına and Munzur Valleys. In her ethnographic work on the GAP project, Leila Harris argues that dams should not just be thought of in terms of their negative and positive impact, but rather in the manner in which they participate in different social reconfigurations. Taken as archaeological artifacts, as I have described above, dams can serve as good chronological markers, signs of their time that can illuminate certain aspects of Turkey’s political, economic, and social history. As representatives of their time they are also a reflection of the country’s position vis-à-vis the rest of the world. Dams in Turkey have witnessed the demise of an empire, helped to build a nation, fought in the Cold War on the side of American Imperialism, and will, according to some, one day even solve Turkey’s Kurdish Question. So perhaps the last thing the Sultan Mahmut, Çubuk-1, Sariyar, Seyhan, Keban, and the more than 700 other dams in Turkey concern themselves with, in the end, is provide water or produce electricity. Posted in Dams, Environment, History, Imperialism, Infrastructures, Memory Studies, Political Ecology, TurkeyBookmark the permalink.